It’s not just a catchy title. I lost my FiOS connectivity Saturday morning, rendering my Verizon tripe-play package of voice, data, and television inoperative. The culprit? Squirrels. I blogged my original install here. I’ve linked to a few of the original photos in the narrative below. Voice, Video, and Data were all humming away Saturday morning. I phoned my parents, checked the Best Buy website for LCD pricing, and the kids watched some TV. After late morning family excursion to the park, supermarket, and a failed quest for Estes rocket engines for my son, we returned home to a home not unlike one circa 1900 (Not necessarily a bad thing). Sometime between 9AM and 1PM, we lost optical connectivity. I went down to the basement, disconnected the backup battery, and power cycled the Tellabs (TLAB) ONU terminal. Nothing. Opened the ONU – aha – red lights where there had been none. Not good. Looks like an optical RX failure. Visual inspection of the fiber from where it emerged from the conduit all the way to the pole mounted connecterized service interface showed nothing out of the ordinary. I call Verizon on my cell phone. They run a remote loop test and confirm I’m down. They file a ticket and commit to fix the issue by November 28th (3 Days?!!?!??). It is 2 PM on the 25th. Nothing happens for 4 hours. Cell phone rings. It’s Verizon. They’re working on the problem. Guy on phone tells me it’s a wide issue and crews are working on the issue now. Hmmm. 10PM Saturday night. Watching Downfall from Netflix (the whole circa 1900 lost it’s appeal quickly) and the doorbell rings. My wife and I jump – who rings your doorbell at 10PM? It’s two Verizon techs and they are walking around my front yard. I explain the buried conduit and show how it’s wired. They want to see my ONU, and I invite them in. They see the lights they expect to see on the ONU and leave. Movie is over at 11PM. Verizon truck still outside. They’ve got the connecterized splitter inside the truck and are checking it out as I spy through the windows. I leave them alone and go to bed with their trucks yellow warning light flashing through the bedroom windows as it spins. Kids wake up at 6AM. Dark outside. Verizon truck still there. At 8AM I decide to offer the guys some coffee and I run into the Verizon guy as I exit… he’s smiling. They found the problem. 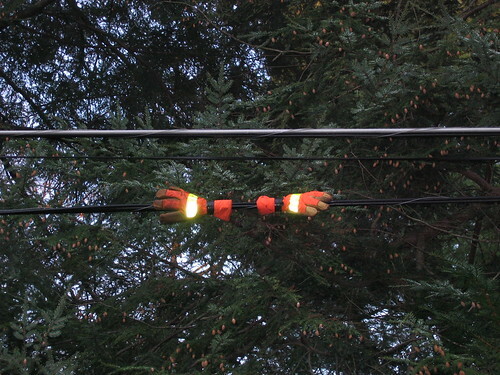 He walks me 200m down the street and points to a pair of work gloves duct taped to the fiber stretched along the pole. They had quickly figured out that some of the fibers from the local splitter cabinet had been cut, but only a few. Considering they are all bundled, this was a bit odd. Verizon hooked up a high power laser (Neon/Argon? Man that must be one hell of a laser…) that emitted visible light and visually inspected the fiber looking up from the ground. They did this three times. Nothing. The fourth time they used the bucket truck to look at the fiber from above, and they spotted some small pinholes of light leaking out. Turns out the fiber had chew marks on it, most likely from a squirrel. The tech had never seen anything like it. They swapped my house onto another fiber drop from the splitter until a crew can come out and replace the entire bundle. The tech duct taped his gloved to the fiber to mark the failure. Overall, I thought Verizon handled the failure very well. I’m not sure Comcast (CMCSA) would spend the night troubleshooting their coax for voice issues. There are upsides to the old-school Telco mentality, though as a Verizon shareholder I shudder to think what this repair will cost them overall. Closing note: my wife asked – did the squirrel get electrocuted? Author is long Verizon and Tellabs and holds Comcast puts. Thanks for the tip. I’ll make sure to shoot ALL of the squirrels in my neighborhood. FIOS has improved my VoIP service (Sunrocket.com). No Video yet in my neck of the woods. Verizon needs to attend a town meeting. I hope they can re-coupe their infrastructure investment. Did the squirrel get electrocuted? More like enlightened…! Awesome story. Verizon needs to stop using that nut-flavored cable cladding. You won’t believe that exact same thing happened to my cable line back in the summer. I can’t wait for Fios to arrive in my area. Currently have cable through Comcast. Was having a modem issue and when I called the first appt they could give me was 10 DAYS later! I work from home and can’t do squat without the internet. So basically they were going to cost me $1000+ until they could get out to my house. Absolutely unacceptable. With cust service like that, Verizon will make up the costs of that repair by gaining and holding on to alot of customers. I hope you realize that you get exceptional service because of this blog. I had FIOS installed in my apartment about 14 months ago and I was actually worried about something like this happening. They left a 30ft fiber run laying above ground for about 2 weeks and we have deer, fox, and teenage kids (obnoxious little buggers) in the area. Long story – short. Squirrels like fritos and peanut butter. Slacker: Fritos and peanut butter? Doesn’t the fat content endanger the squirrel? I’ve always heard the expression that even a blind squirrel roots up an acorn once in a while. Now I know where blind squirrels come from!!! There were reports of shark attacks when the first transalantic cables were installed see (http://yarchive.net/phone/oceanic_cable.html). Supposedly the sharks were attracted to the electromagnetic radiation from the cables which was similar to dying prey…. Perhaps FTTH signals mimic the scent of a ripe acorn…Squirrels! No, just blind in one eye.